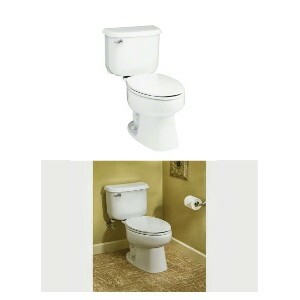 Sterling / Kohler Elongated 12'' Regular Height Toilet. Fully Glazed Interior Trap way to make effluent slip right through. Home Depot Lowes Sterling / Kohler Toilet Version skips this process, effluent builds up leading to toilet replacement. Commercial Fill Valve, Full size ports. 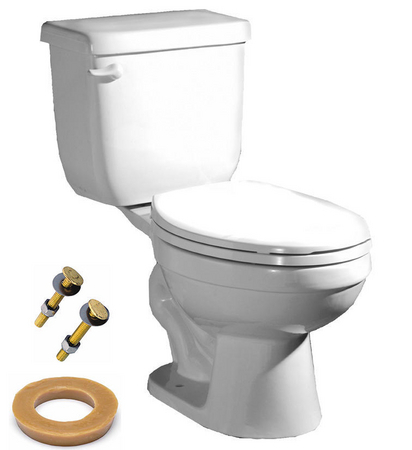 Home Depot Lowes Sterling / Kohler Toilet Version puts a standard fill valve in with small ports in that will need replacement in a year or 2 bringing you back into ther stores. YOU MAY BE UNDER THE IMPRESSION THAT YOU ARE GETTING THE SAME PRODUCTS AT HOME DEPOT, LOWES OR ANOTHER RETAILER, THAT IS 100% FALSE, THE PRODUCTS ARE DIFFERENT AND DESIGNED TO BRING YOU BACK TO THERE STORES. COMPARE PRODUCT FEATURES / SPECIFICATIONS TO BE SURE YOU ARE GETTING APPLES FOR APPLES OR THE SAME EXACT PRODUCT. and Disposal of Old Toilet. Scroll To Bottom For Pro Flow Round Front Toilet. WANT TOILETS THAT FLUSH GREAT? These toilets use 1.6 Gallons of water and flush excellent. I recommend these toilets because I never have to go back to snake it or work on it. Its Commercial Construction at a Residential price. Try getting that at Home Depot or Lowe’s, Why are Sterling/Kohler Toilets so good? They just won’t cut corners to sell to the big stores. Wonder why Home Depot and Lowe’s can charge such less prices for there toilets? CLICK THE HOME DEPOT VS YOUR LOCAL CONTRACTOR LINK TO FIND OUT WHY. One way to cut corners on a toilet is to not porcelain glaze the interior trap way of the toilet, leaving the passageway rough, which causes effluent and waste to slowly stick to the insides causing a clog. STERLING WON”T CUT CORNERS. There trap ways are glazed all the way so the passageway for waste is as smooth as the outside of the toilet, making clogs less frequent and almost a thing of the past. Did you know Home Depot and Lowe's Toilets DON'T COME WITH A SEAT? OUCH! Did you know most manufacturers make there own versions of toilets for Home Depot? Did you know Sterling won’t do that they sell only 1 dependable line of products, they won’t buckle to Home Depot and Lowe’s substandard product lines. Sterling won’t cut corners. Home Depot Lowes Toilets skips this process, effluent builds up leading to toilet replacement. Left is a Kohler Toilet, purchased by one of my customers from Home Depot, In the circles you can see where there were several Cracks. Kohler pulls them glazes over cracks (you can see the darker glaze over cracks in the squares) and sells it as new to Home Depot or Lowes, this toilet lasted less than 2 years. Each time you sit on it the cracks start to reopen. At The big Box Stores, the Toilets They Sell are Seconds or repaired. Thier Toilets are not the same Sold By Plumbers. This Toilet features a Fully Glazed Interior Trap way to make effluent slip right through. Please Call or Text 603-401-5678 for a quote.